A twin-island Caribbean state, Antigua and Barbuda consists of two major inhabited islands (Antigua and Barbuda) and a number of smaller ones. It is part of the north-eastern Caribbean group known as the Leeward Islands – a chain of islands lying between the Caribbean Sea and the North Atlantic Ocean and stretching from the Virgin Islands in the north to Dominica at its most southerly. The country became an independent state within the Commonwealth of Nations on 1 November 1981, shortly after joining the Organisation of Eastern Caribbean States (OECS) as one of its seven founding members and as signatories to the Treaty of Basseterre. The treaty was replaced and revised in 2010 to create an economic union. This established a single financial and economic space within which goods, people and capital can move freely. Subsequently, monetary and fiscal policies were harmonised and member states adopted a common approach to trade, health, education, the environment, and the development of such sectors as agriculture, tourism and energy. At one time, crop production – particularly tobacco, cotton, ginger and sugar cane – was the dominant economic sector locally. Following the 1981 secession from the UK, however, the local service sector, especially tourism, became the prime economic engine and the most significant foreign exchange earner. With some 365 beaches and surrounding clean, clear turquoise waters, tourism is by far the largest industry in Antigua and Barbuda. In 2017, it accounted for 52% of the country’s GDP and was directly responsible for 5,000 jobs across several related sectors, including accommodation, entertainment and retail. In order to attract foreign investment, the country has introduced a special tax regime that allows international business companies (IBCs) to apply to the Antigua & Barbuda Investment Authority in order to secure a variety of incentives and concessions, including tax holidays and tax credits. The government is also looking to diversify the local economy by promoting several sectors seen as not requiring a substantial investment in bricks-and-mortar structures. As a result, it now provides several incentives for would-be investors in the services sector. These are in addition to such incentives as the customs duty, corporate income tax, withholding tax and sales tax exemptions that were already on offer. These new incentives include: (a) changes to customs control and management in order to eliminate the need for importers to produce a Certificate of Good Standing; (b) the launch of the ASYCUDA World Manifest module, which allows ship manifests to be filed before their arrival in Antigua and Barbuda; and (c) the launch of the Public Access Module, which aims to make it easier to search for land records and relevant ownership information via the relevant online platforms. 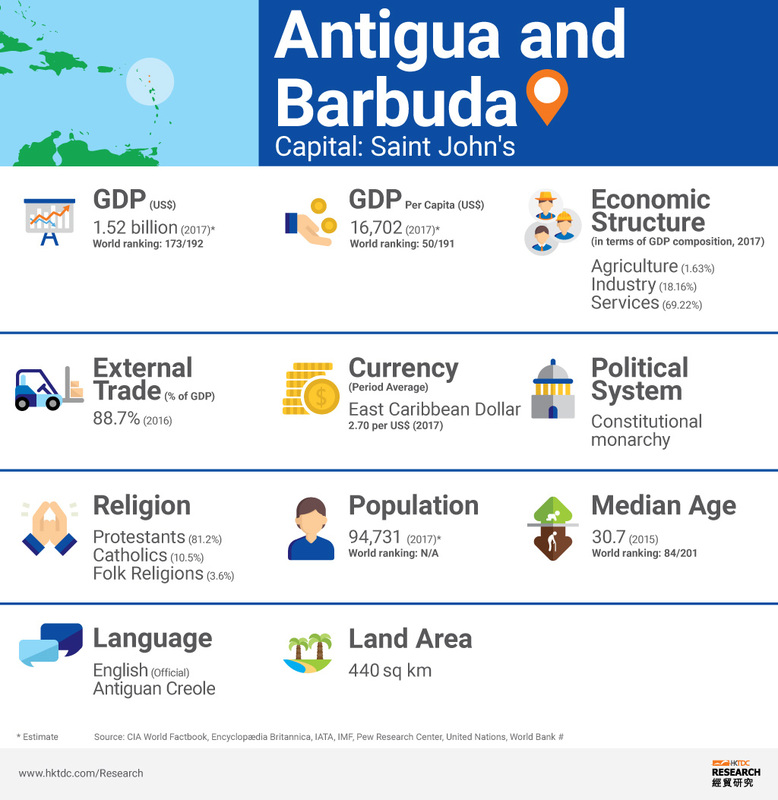 More information on the investment environment and the relevant regulations can be found at the official website of the Government of Antigua and Barbuda. The inflows of foreign direct investment (FDI) to Antigua and Barbuda amounted to US$61 million in 2017. As of the end of 2016, China’s total stock of FDI in Antigua and Barbuda topped US$6.7 million, up from US$1.3 million in 2007. The level of Hong Kong’s trade and investment with Antigua and Barbuda, however, remains relatively insignificant.